Hello traders, it is 2:46 PM, Saturday, February 28, 2015 (EST) in New York, USA. I am on my PC to write a post on the Fibonacci 38.2% retracement level breakouts. It is very important in forex trading to know the probability of Fibonacci 38.2% breakouts after a reversal. I already mentioned that a forex trading strategy cannot be a winning one with out the application of Fibonacci retracement tool. Let see how the probability of a Fibonacci 38.2% retracement level breakout can be measured. In the above price chart, we can see after the strong bearish trend reversal the price moved to the 38.2% Fibonacci retracement level and pulled back to reach the L2 (Low-2). 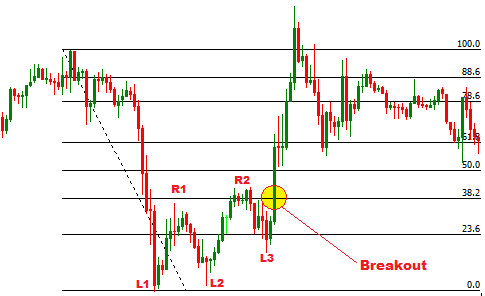 Here the price again reached the Fibonacci 100% retracement level of L1 after reaching the R1 resistance level. Then the price was again pushed to the Fibonacci 38.2%, and the price could not break the Fibonacci 38.2% retracement level and pulled back to L3. After the pull back, the price reached the Fibonacci 38.2% retracement level for the third time and became able to break the 38.2% retracement level. 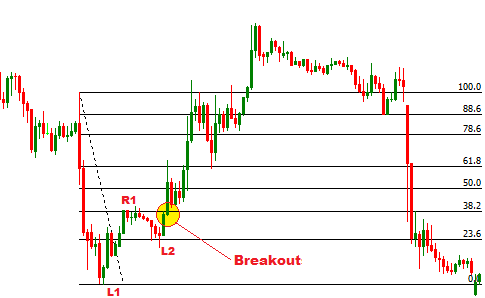 In the above price chart, another situation of 38.2% Fibonacci retracement level breakout is illustrated. Here when the price reached to the 38.2% Fibonacci retracement level for the first time just after the reversal, it was pulled back to the L2. Here we can see the L2 is a higher low, in other words price was pushed to the 38.2% after reversed from the L2, which is higher than the L1. The 23.6% Fibonacci retracement level became the strong support point. The 38.2% Fibonacci retracement level was broken by the price at second attempt. 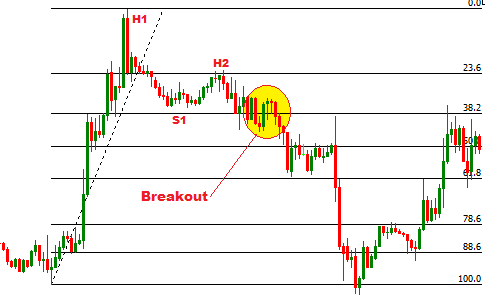 In the above price chart, a bullish trend is reversed at H1, and reached to the 38.2% Fibonacci retracement level. When it first reached to 38.2% Fibonacci retracement level, it could not break the support level, and pushed back to H2. H2 is placed at the 23.6% Fibonacci retracement level, and 23.6% line represented strong resistance level. Here we can see the price became able to break the 38.2% Fibonacci retracement levels at second attempt. By studding more than 100 situations as above, I came to the following interpretations. When the price reaches to the 38.2% Fibonacci retracement level for the first time after the reversal of a trend, a breakout of 38.2% Fibonacci retracement level is rarely found. When the price reaches to 38.2% Fibonacci retracement level and pulled or pushed back to the 100% Fibonacci retracement level of previous low or high, a breakout of 38.2% Fibonacci retracement level rarely happens. When the price reaches to the 38.2% Fibonacci retracement level for the third time, a break out is highly expected. When the 23.6% Fibonacci retracement level represents strong support or resistance level, a breakout of 38.2% Fibonacci retracement level is common. If the price fails to make a lower low or higher high, the brekouts of 38.2% Fibonacci retracement level becomes usual at second attempt. There is no universal truth in the theory of forex trading . Traders have to analyze the current fundamental and sentiment analysis in order to define the potential price movements. Only the practical market experience can make you a winner in the currency war. How to trade 38.2% fibonacci retracement level. I hope this post will help you to find the reliable entry and exit price levels, and to select the safe stop loss and to determine reachable profit target. Drop a comment below, If you have any questions !! !